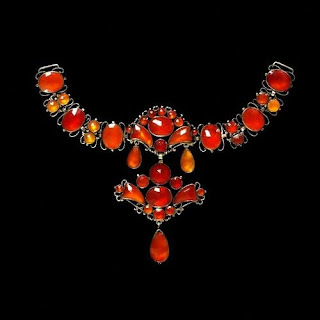 Blazing fire, autumn color, flashing warmth - all of this is found in the lovely stone known as Carnelian! An interesting semi-precious gem stone we do not usually associate with Victorian jewelry, Carnelian (or Cornelian) is one of the oldest known gemstones and has actually been used decoratively for thousands of years, including the Victorian years. 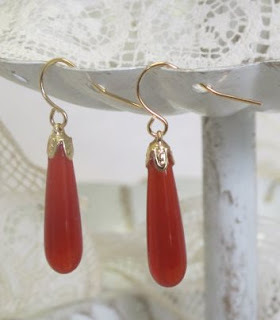 A form of Chalcedony, Carnelian is transclucent and can range from blood red tones to lighter peachy tones. 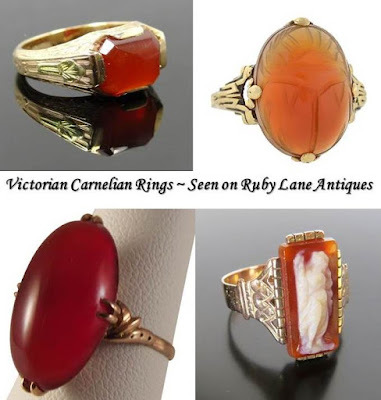 Other stones are also classified as forms of Chalcedony and a couple can be confused with Carnelian. The name Sard can be used interchangeably with Carnelian, but it is generally accepted that Chalcedony is designated Carnelian on the redder end of the color spectrum and labeled Sard on the browner end of the spectrum. Carnelian is as hard as glass. In fact, it is hard enough for engraving and carving. The stone was often used for signet rings because the wax wouldn’t stick to the carnelian. During the Victorian era it was frequently used for watch fobs. 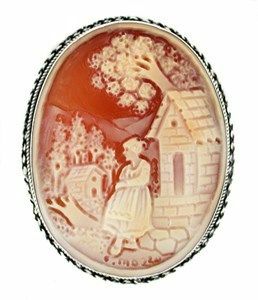 Carnelian Shell Cameo - "Rebekah and the Well"
Queen Victoria further popularized Carnelian with her love of Scottish jewelry. She had Stuart ancestry and after she purchased Balmoral Castle in Scotland, she enthusiastically embraced all things Scottish. Naturally, fashion followed the Queen! 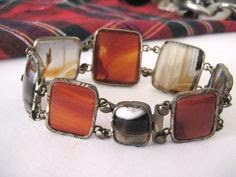 Scottish jewelry often incorporated stones such as Agate, Moss Agate, Carnelian, Bloodstone, Jasper, and Cairngorm. 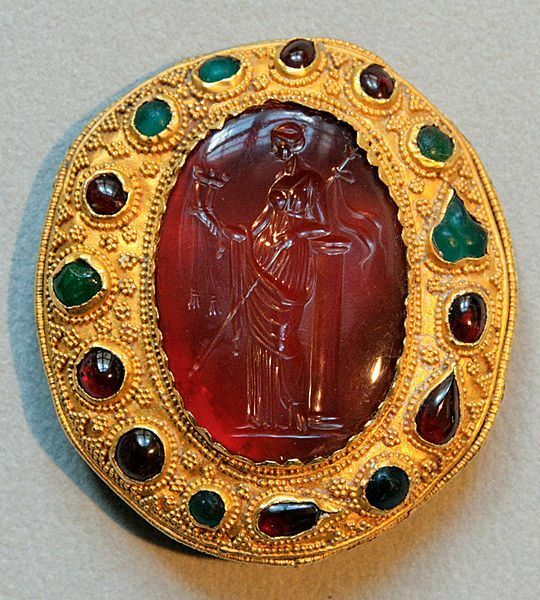 And since the industrial revolution with its more efficient manufacturing techniques was well underway, semi-precious and non-precious jewelry became affordable for the emerging middle class. 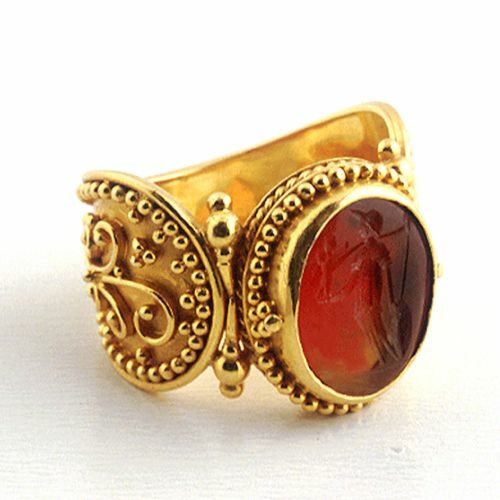 You will be right in style accessorizing your 1860s ensemble with Carnelian. In the mid-1860s it seems to most often appear with other stones in jewelry pieces, but now and then it can be seen as a stand-alone element. 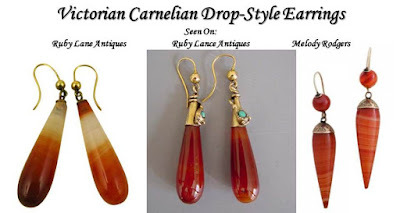 One of my favorite styles of carnelian is when it is used in drop-style earrings. I am currently offering Carnelian “drop” earrings in my shop. And if you are interested in purchasing a coordinating pair of Carnelian bead bracelets, let me know and I will custom-make a pair to fit your wrists! If you want to have fun looking at more historic Carnelian jewelry, check out my Pinterest board here! Enjoy! 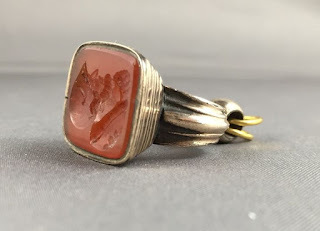 Follow Holly Sheen's board Carnelian Jewelry on Pinterest.